It's the second week of heats and seven more hopefuls need to pull out all the stops to prove to judges John Torode and Gregg Wallace that they have potential. It's the second week of Heats and seven more hopefuls need to pull out all the stops to prove to judges John Torode and Gregg Wallace that they have the potential to rise above the rest to become MasterChef 2019 champion. featured ingredients include poussin, lamb mince, halibut and squid. They have an hour and ten minutes to dazzle the judges and prove they are good enough to stay in the competition. The stakes are high in this round and it's important to choose wisely because after tasting all seven dishes, John and Gregg will decide which four cooks are good enough to stay, while three cooks will be sent straight home. food of this year's new contenders to the throne. 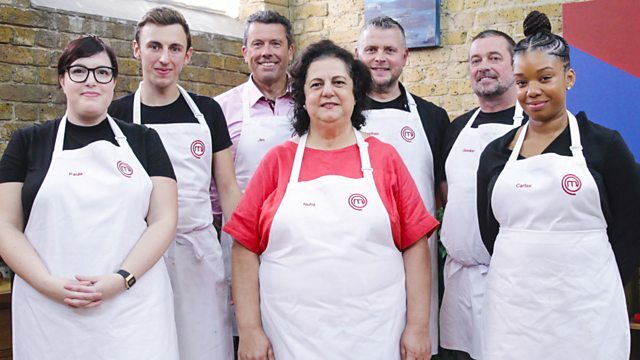 In this heat the contestants must attempt to impress MasterChef champions Saliha Mahmood-Ahmed (2017), Steven Wallis (2007) and 2016 semi-finalist Liz Cottam. After the four hopefuls have cooked, John and Gregg will decide which three contestants deserve to take the next step in the competition and go through to the quarter-final. In a competition where only the food matters, these amateurs will need to be good to survive - taking their first step towards being crowned MasterChef Champion 2019. "Clear thinking and clear planning"